Celebrating 72 years of serving Wichita's Italian Food. Rose and Tom Simone started serving Wichita it's first home cooked Italian meals in 1944. "Rosie's" was just north of the current location at 3411 N. Broadway. The small bungalow only seated 20 customers, but a strong loyalty developed between Rosie and her guests, and she prospered. In 1950 Rosie's brother and wife, John and Mary Savute Sr. bought the restaurant business. In 1952, the restaurant's business was moved to the present location at 3303 N Broadway. Seating was expanded to the area covered by the front dining room, and a larger kitchen enabled many more customers to sample the authentic Italian sauces and meals. The name "Rosie's" was changed to "Savute's" in 1960. Since then other renovations have occurred, making the total seating capacity to 245. Opening in 1980 was the addition of the Stick' n Rudder Club. The states most unique club featuring aircraft memorabilia and airline chairs for seating. Come relax in airline seats for a cocktail. In 2002, a patio was added with seating for 40. Come experience outdoor dining or a refreshing drink from the bar. Thanks to the leadership of John Savute Sr., Mary Savute, John Savute Jr. and Mattie Jo Savute, the restaurant is happy to be serving third and fourth generations of the same families who have eaten on North Broadway for over 60 years. 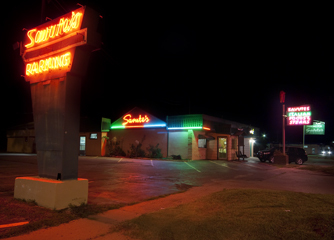 As such "Savute's" is proud to be called the oldest Italian restaurant operating in Wichita.